"To ourselves... new paganism... omphalos": Stephen thinks of three very different expressions, all of them apparently associated with Mulligan and his plans for the tower. The phrases encompass a wide range of implied meanings: political, aesthetic, spiritual, sexual. But all seem connected to a countercultural vision: avant-garde and anti-bourgeois. The Greek word omphalos reappears elsewhere in the novel and collects a variety of associations. “To ourselves” resembles the English sense of Sinn Féin, “we ourselves.” As Gifford observes, this phrase became a slogan for political independence a year or two after the time represented in the novel. Arthur Griffith visited the tower, and in 1905 Oliver Gogarty worked with him to help organize the movement that in 1907 became Sinn Féin. But in the 1890s and early 1900s the phrase was connected more broadly with the Irish Literary Revival, not simply with politics. 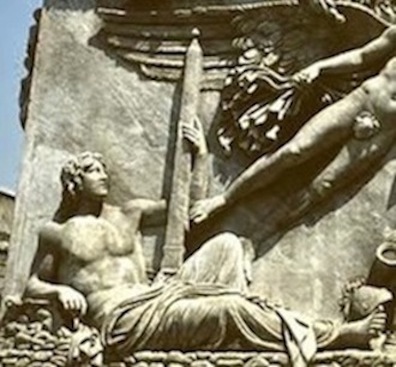 This emphasis upon sexuality suggests a connection with "omphalos," the word for "navel" in Greek, which in Mulligan's view is the language of intellectual and sensual liberation. The prophetic oracle at Delphi was called an omphalos, being regarded as the center of the ancient world and a spiritual life-source. Joyce's awareness of this connotation of omphalos is made apparent in Circe, when Mulligan's Black Mass on the top of the tower takes place "On an eminence, the centre of the earth." In Proteus Stephen thinks of "mystic monks" who seek to return to the source of all being by meditating on their bellybuttons: "Will you be as gods? Gaze in your omphalos." Ellmann suggests that Gogarty called the tower the omphalos both "because it resembled a navel and because it might prove 'the temple of neo-paganism' as important to the world as the navel-stone at Delphi" (172). (Another possibility is that it was the first of the Martello towers built along the approaches to Dublin.) The top of the tower does resemble a navel, but the whole tower, as well as the navel-stone that Ellmann mentions, might also be seen as phallic in shape. 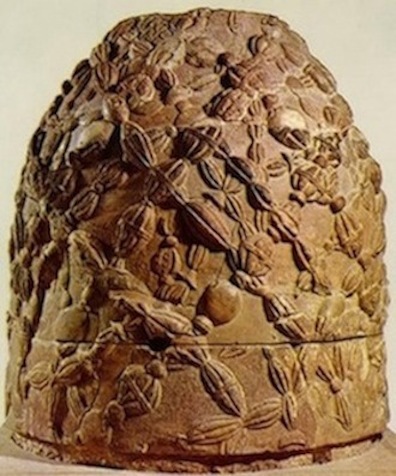 The large sculpted stone that stood at Delphi from the 4th century BC onward, a replacement for a still more ancient one, survives, and its appearance is certainly more phallic than umbilical. Omphalos stone from Delphi. Source: www.utexas.edu. Relief statue on column commissioned by the co-emperors Marcus Aurelius and Lucius Verus in the 2nd c. AD to honor their predecessor, Emperor Antoninus. Source: wikicompany.org. Jon Stewart, The Daily Show.